I've created a google map of all the places we went and the path we took if you're interested in walking this tour yourself. But I HIGHLY recommend hiring one of the incredible tour guides from Prague Guides. We started our tour at the Můstek metro stop. This location marks the old border between the old town and new city. Můstek in Czech means Bridge. The reasons it is so named is because, upon excavation of this area, they found the remains of an old bridge, a moat and a steep wall. On the wall leading into the church courtyard, you can still see old carvings left on the remnants of the medieval wall. In the centre of the square, you'll see a beautiful lamppost, shaped in cubist zigzags. This cubist architecture and decorative design can be found all over Prague and was a uniquely Czech form of art. Although it was only in vogue for a brief time, it leaves a powerful and lasting impression on those who view it. The restaurant along Národní Street are almost as old as the city itself and are less touristy than the one found right off Wenceslas Street. Give any one of them a peek inside and try sampling their authentic food. Walking down Jungmannova street from Mustek station, you come to Jungmann Square. Across from the square is Adria Palace, now a large shopping plaza and business centre, the palace is one of the most important architectural monuments in the city. Built in 1923 by architect Josef Zasche it represents the uniquely Czech form of architecture, Rondocubism. Rondocubism is famous for geometric edges, cubes and pyramids complimented by Slavic icons of design like crescents and circles. The building is also decorated with sculptures by Josef Malínský. The sculptures peek out from under the canopied doorways and flank either side of the beautiful windows that surround and the facade. In the centre of the Josef Jungmann Square is a statue of the man himself. Josef Jungmann was a critical figure to the Czech people as he was a talented writer who revolutionised the Czech language. Initially, the Czech language was seen as simple and only for the peasants, but Josef, with his incredible writing, took the language from peasant to poets. On the opposite side of the Square, is the Church of Our Lady of the Snows. Emperor Charles IV originally founded the church in 1347. In 1603 the church was donated by Emperor Rudolf II to the Franciscan monastery and therein became a Franciscan church. Although the church itself is something to behold, the Franciscan Gardens, behind the church are where the real life of the Czech people lies. The Franscians believed that God could be found in nature and as such, their gardens were a vital part of their worship. The gardens are open all year round and unlike the stuffy and imposing church, it is full of everyday people, laughing in the playground, making conversation on the benches and relaxing among the manicured trees. A French Baroque garden was designed for the church, along with a pavilion, walled fence and herb garden which the members of the clergy would tend to. There are rows and rows of roses and a sculptural fountain in the centre of the garden. Behind the busy city, this place feels like an oasis and is a hidden gem that many don't even know is there. After strolling through the gardens, head through the Lucerna Arcade to access Wenceslas Square. But don't rush the journey! These arcades are some of the most beautiful art-nouveau arcades from Prague's history. Inside these covered throughways are shops, cafes and hidden treasures. 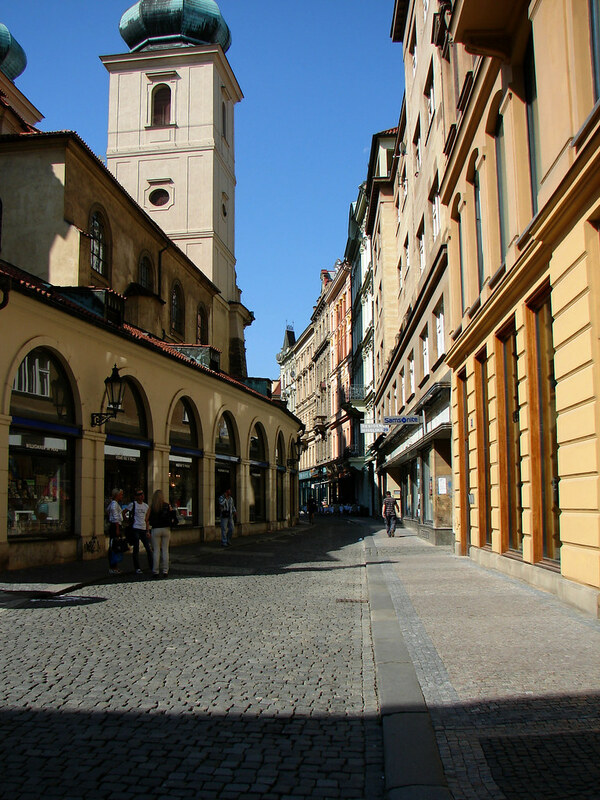 The arcade is located between Štěpánská and Vodičkova street. Inside the arcade in addition to shops and cafes, you'll even find a cinema! They play both Czech and English films and if you're lucky you will be able to see your movie inside the original art-nouveau theatre. The seats aren't the most comfortable, but the atmosphere is everything. In front of the theatre hangs, and you can't miss it, artist David Černý’s sculpture Kun (which means Horse in Czech). The piece was created in 1999 and is the counterpart to the equestrian statue of St. Wenceslas square. The artist never made clear the meaning of the sculpture but it is thought to be a reference to the president at the time and the fact he hung out to dry the Czech people. Beside the Lucerna Arcade, you'll find the Novák Arcade. This arcade is another example of incredible art-nouveau design complete with a sparkling mosaic of Czech daily life on the interior. As you exit the arcade, you come up upon Wenceslas Square. Wenceslas Square was at one point in medieval times, the Horse Market, where farmers would come to sell their horses to the King's Guard and local merchants. It was officially named Wenceslas square in 1848. Saint Wenceslas is the patron saint of Bohemia and as such, is an important figure for the Czech people. It is for this reason that this square is such an important place for the Czech people to meet and political rallies have been held. At the south-east corner of the plaza is the neoclassical Czech National Museum and on the other side is the border to New Town and the Old Town. This square has been the site of many important events, some good and some a stain to the history of this city. The Nazi's used this square for one of their many demonstrations and in 1969, a student, Jan Palach, set himself on fire to protest of the invasion of the Soviet Union in Prague. His actions set off national revolution, and he is memorialized on the square today. When the Czech hockey team defeated the USSR at the World Championship, 1500,000 people met here to celebrate their win as the underdog. And, most importantly, in 1989, the Velvet Revolution was started here with hundreds of Czechs rising against their government forming the free state of the Czech Republic as it stands today. Surrounding the square are some of the most incredible buildings in Prague, representing all different kinds of architectural styles. You’ll see neo-gothic, neo-renaissance and neo-baroque. There’s also an abundance of art nouveau architecture with its sensual curves and bright colours. Then there is the structured and grey lines of functionalism. In the mid-20th century, the Soviet rule was form follows function and not the other way around. Look over at the Hotel Jalta for an example of this rigid style of design. After continuing down Wenceslas Square, turn up Rytířská street. As you walk up the street, turn onto Železná and you'll see three iconic buildings facing each other. The Estates Theatre, the Church of St Havel and the Karolinum. The Estates Theatre was built in the 18th century by designer Anton Haffenecker. The building was designed in the neoclassical style and is still today preserved in near original state. Above the portal to the theatres, there is a motto inscribed above the door that says "Patriae et Musis" which translates into, "To the Native Land and the Muses". A very fitting phrase to keep in your mind as you enter through the doors to be transported by the productions that lie within. The building remains the only theatre left standing where Mozart performed. In 1791, Mozart’s La Clemenza di Tito was staged in public here for the first time. 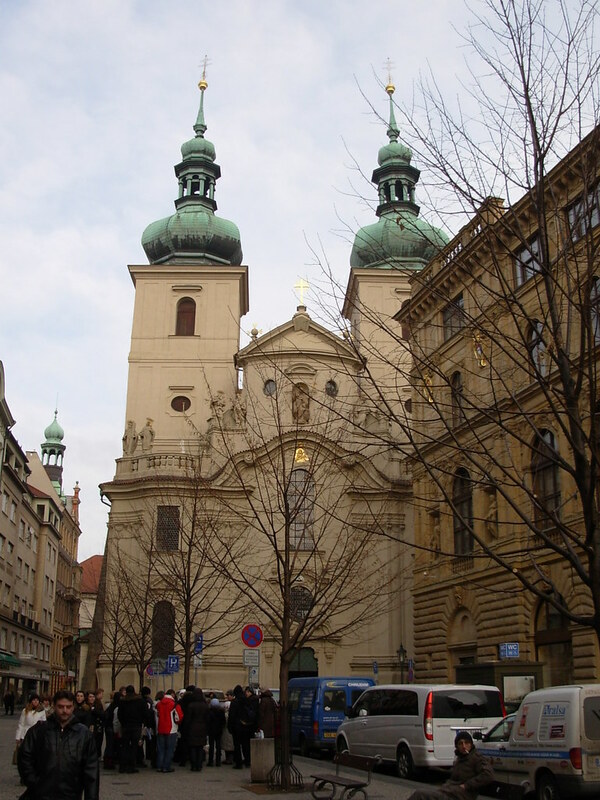 The Church of St Havel is one of the best examples of baroque architecture and furnishings in Prague and is worth a peek in the doors if you're interesting in Baroque Art. The church was established in 1232, but it's Baroque architectural facade was built in 1723. Inside you'll find works of art such as the famous “Calvary” by Ferdinand Brokoff. The Karolinum is a series of buildings that makes up the seat of the Charles University, established by Emperor Charles IV. 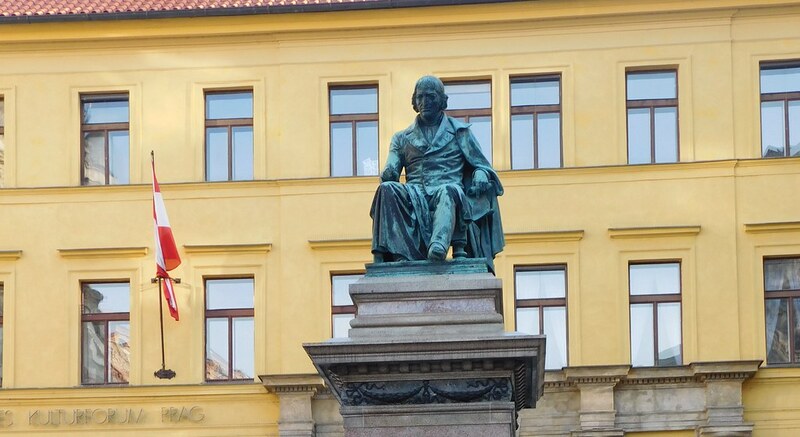 Charles was obsessed with the new universities popping up in all the other great cities of Europe and wanted Prague to have a national college where they could grow the minds of their students. These buildings contain some of the oldest dormitories in Europe, and one can only imagine how cool it would be to live in such a historical building. Continue walking down Ovocný trh. Take a leisurely stroll and admire all the incredible facades of these noble houses. Once more, walking along this street, you can pick out a hodgepodge of architectural styles. From Baroque to Cubist to functionalism. Together they are like a patchwork quilt of Prague's artistic past. Take your time on this quiet little lane. There are so many details to admire. It's very rare to come upon a street this full of history in Prague that isn't littered in tourists. At the end of the street, before turning back onto the main road, you'll come upon the Cafe Orient. The Cafe Orient represents that unique cubist architecture and decor that was so rampant in Prague in the early 20th century. Josef Gočár designed the Cafe in 1912. Every little detail in this establishment has flourishes of cubist stylings, from the lampshades to coat hooks, you're transported to another era once you step in the door. Even just standing outside you can see how this stylists form of architecture and decor was so becoming and captured the minds of so many young Czechs. As you turn the corner from the Cafe Orient, you'll see off in the distance a looming, black gothic tower. This is the Powder Tower, a remnant of the old city, dating back to the 11th century. The tower was not used as protection but rather as an attractive entrance for guests to pass through when they entered the town. At one time, the tower was used to store gunpowder and get its official name from the massive amounts stored there. Although the tower suffered damage through some of the battles fought within the city most of its original structure has remained. Only the statues and ornamentation had to be replaced or restored. Beside the Powder Tower stands the Art Nouveau gem called the Obecní dům or Municipal House. If you are feeling thirsty or want to rest your legs, this is a perfect stop. 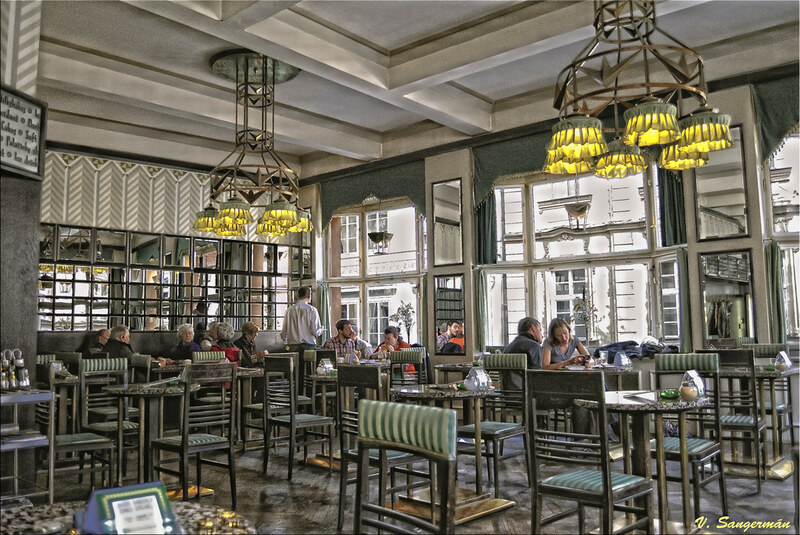 Although mostly frequented by tourists, this old restaurant was once the epitome of art nouveau decor where the who's who of Czech society would meet in the 1920s. After stopping for a quick drink, pass by Hotel Paris as you make your way down to Old Town along Jakubská street. 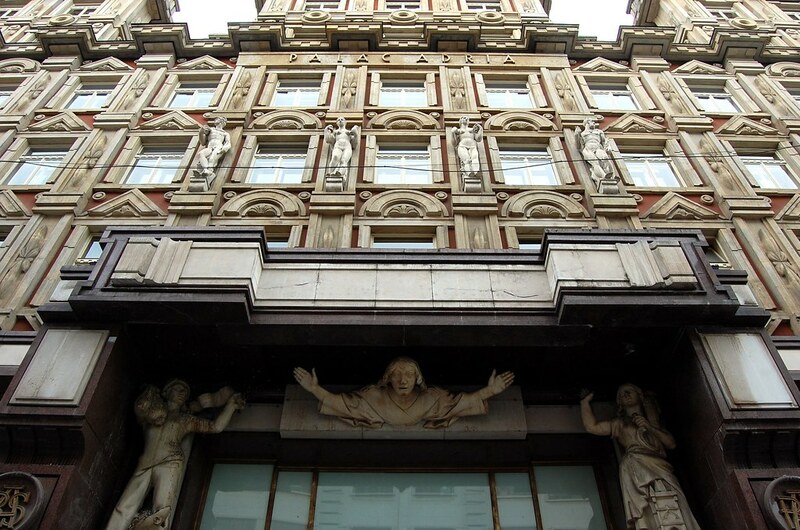 Hotel Paris is another stunning example of art nouveau architecture and stylish designs. Take a peek inside and see how many gilded mirror you can see right there in the lobby. On the way into old town, make sure to stop off at The Basilica of St. James. The basilica has a stunning set of sculptures, hanging off the facade of the church but since the rest of the building blends into the balance of the row houses, some people right walk right by. When we walk in the door, prepare to be in awe of one of the most fabulous baroque interiors I've ever seen. Originally the church was built in the gothic fashion but after a fire in 1689, the church was reconstructed in the Baroque style. And what a baroque design it is. One of the strangest items in the church is a mummified forearm that's over 400 years old. The story goes that a thief broke into the church and tried to steal the statue of the Virgin Mary. As the thief went to take the statue, Saint Mary grabbed his arm and would not let go. When the monks arrived in the morning, the thief was still there being held by the statue. They promptly cut off his hand in retribution of his attempted crime and then put it on display in the church to teach a lesson to other sinners who would pass through the doors. As we approach the Old Town Square, walk through the quaint little street called Tyn. It's a tiny lane that leads into Old Town Square. On all side of the laneway are shops, restaurants and cafes selling traditional Czech goods and cuisine. Despite it being so close to one of the most popular tourist destinations in Prague, the courtyard remains busy but not overwhelming. The shop "Botanica" sells soaps, creams, tonic water for your face and much more. It feels like a modern apothecary shop made with organic materials grown in the Czech Republic. Worth taking a look inside. As you continue down Tyn, you pass through a very narrow corridor. On one side of you is the brick walls of the Church of Our Lady. At the end of the pathway, the walls open up to a GIANT square, littered with hundreds of people, staring up at all the brilliant buildings surrounding them. This is Old Town Square. The Church of Our Lady stands tall and omnipresent over the east side of the Square. It was built in the 14th century in the late Gothic style by Peter Parler. Parler's relief of the Crucifixion above the northern portal is an incredible example of sculpture and architecture from this period. If you don't venture inside, be sure to at least get close up to the building and admire all the small details and decoration. Inside the church, you'll find a mixture of Gothic and Baroque works. Paintings by Karel Škréta painted in 1649 dot the walls and at the back of the church lies the oldest pipe organ in the Czech Republic. It was built in 1673 by Heinrich Mundt and still works to this day. 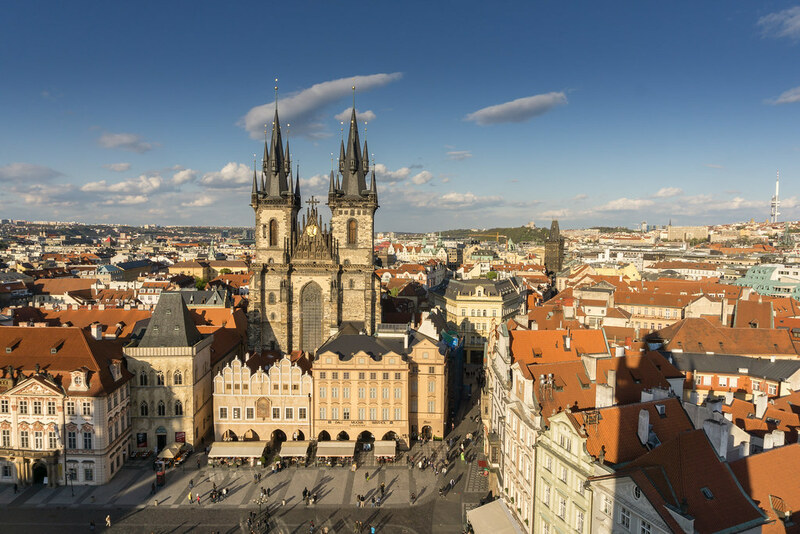 In the centre of the square is an enormous monument of the religious reformer, Jan Hus. The statue was created to mark the 500th anniversary of his death. Jan Hus was a martyr and burnt at the stake for his beliefs which insighted the Hussite Wars. One of my favourite buildings on the square is the Kinský Palace. It's pink decorations, and white exterior makes it looks like a frilly, Rococo birthday cake. In 2006 it became a National Museum, but originally it was built as a palace for a noble family in 1755. The Prague Astronomical Clock is THE BIGGEST attraction in Prague, or at least that's what the hoards of people crowding around it would make you believe. 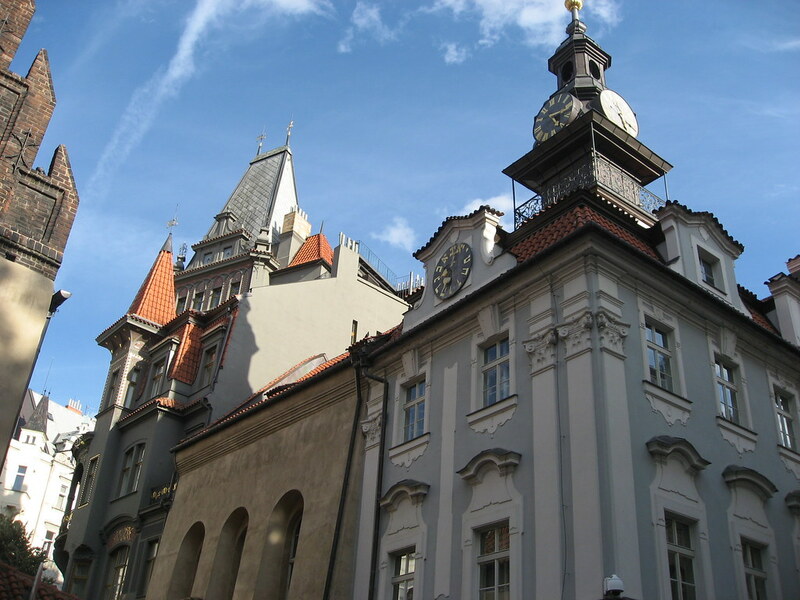 The clock is housed up on the southern wall of the Old Town Hall and has been there, in parts, since 1410. Legend says that if something bad were to befall the clock, Prague itself would fall. Although just a superstitious rumour, it's been enough to keep the clock shiny and new all these years later. There are three main parts to the clock. The first is the dial, which represents the Sun and Moon and their position in the sky. The next is the sculptures of the Apostles who, upon the hour, perform a little show for the onlookers. They move around the clock and are chased by a statue of death. This is what everyone is waiting to see but let me tell you, this little show isn't worth fighting your way through the mob. Plus, once the show is over, the crowds disappear you get a much better view fo the rest of the clock. The final part of the clock is the calendar dial, with different medallions representing the different months of the year and their corresponding astrological signs. Around this time you might be feeling a little peckish, so it's time to stop for something to eat. But don't try and eat anywhere within the square. A small snack from the food vendors in their old wooden stall might be ok but the restaurants surrounding the square are all huge tourists traps. Overpriced and overcrowded. Instead, head outside the square, towards the Jewish Quarter. We stopped off at VKolkovně – the first Pilsner Urquell Restaurant. Pilsner Urquell is one of the most famous of the Czech beers, and this restaurant serves it up plentifully along with traditional Czech dishes. The restaurant has stood here for almost 100 years and aside from some minor renovations, still preserves its historical roots. There is a beer garden open in the Summer where you can sit outside and enjoy the sunshine. Since it's so close to Old Town Square, yet tucked away enough to avoid throngs of tourists, this is a great spot to rest your feet and enjoy a cold glass of beer. After finishing your lunch, let's continue. This part of the tour leads us into the Jewish Quarter of Prague. The Jewish Quarter is the smallest of all the areas and was once a ghetto for the Jewish people of Prague. Jews settled here in the 10th century and despite persecution, throughout the years the quarter prospered up until the 16th century. In 1850 the quarter was renamed "Josefstadt" (Joseph's City) after Joseph II, Holy Roman Emperor who emancipated the Jews with the "Toleration Edict" in 1781. Shortly after that, Jews were allowed to move outside the ghetto and live wherever they wanted in the city. This reduced the general population of the Jewish quarter and only Orthodox, and poor Jews remained living there. Unfortunately, most of the old Jewish Quarter was destroyed in the 20th century, but we are still left a few important building that preserves their people's history and culture. The Spanish Synagogue is one of the newest buildings in this area, built in the same spot as where one of the oldest buildings once stood. As you look up at the building, you might feel as though you aren't in Prague anymore but are looking up at something from Spain. The building was built in the Moorish Revival Style, inspired by the art of Arabic architecture in Spain. Inside you'll see even more of the Moorish design, specifically the impressive gilded and polychromic parquet. The geometric mosaic pieces of wood make the inside of the church feel like the centre of the sun; glowing, warm and a treat for the eyes. Inside you'll find less of a traditional synagogue and more of an exposition of Jewish history in Prague. The High Synagogue and the Jewish Town Hall stand together as some of the most elegant, Renaissance-style buildings along the street. The High Synagogue was built in 1568, the same year as the Town Hall. It was designed to emulate the High Synagogue in Krakow, Poland. The Town Hall was given a Rococo finished facade in the 18th century. It was a meeting house for the Jewish community and as such a very important building to the quarter. The clock on the top of the building is vital to the heart of the city. One clock face contains Roman numerals, but the other has Hebrew numbers, beginning with alpha and continuing counterclockwise are the dial. On the other side of the road, we find the Old Synagogue, which oddly enough is Europe's oldest mediaeval, twin nave synagogue. This building was constructed in 1270 and as such was built in the Gothic style. One of the most iconic pieces of design in this synagogue is the incorporation of the number twelve. Along the doorway, you'll find twelve vines and twelve bunches of grapes, inside you'll see twelve columns and twelve lancet windows. These all represent the twelve tribes of Israel. Legend also has it that inside the Synagogue, up in the attic, there lies the body of a Golem. A golem is a huge creature made of clay that can be brought to life through magic. It is said that one day the Golem will come to life to defend its people. During WWII, the Gestapo never entered the attic during the war and the building was spared the destruction wrought by the Nazis. Perhaps it was the Golem that either scared them off or indeed protected the building from destruction just like the legend says. Either way, this building has a real sense of power and importance when you step through its doors. Little ways away, you'll come across the Pinkas Synagogue. This is the second oldest surviving synagogue in Prague. Today it serves as a museum to commemorate the 78,000 Czech victims of WWII. Along the walls of the Synagogue are the names of the victims, a powerful memory to their lives. There is also along a large exhibition of pictures drawn by children during their incarceration in the concentration camps. These images depict their experiences in the ghetto, their capture and their memories from home. Friedl Dicker-Brandeis was a painter who led these drawing lessons in the camp and hid the drawing before being executed himself. They were later recovered and preserved here in the Pinkas Synagogue. 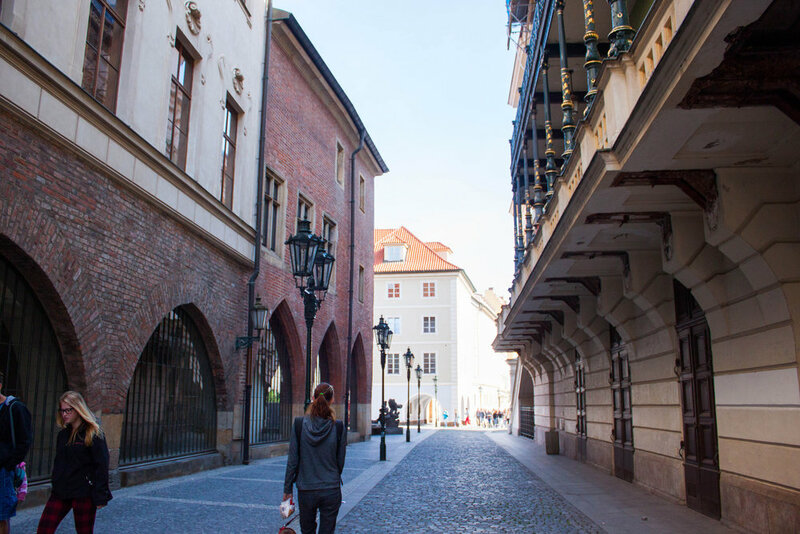 After wandering through the colourful and ornate streets of the Jewish Quarter, we turn down Křižovnická street. As you walk, admire the enormous Rudolfinum Concert Hall. This building is the home of the Czech Philharmonic Orchestra and has been since 1946. It was built in 1885 and is a great place to hear some of Prague's best musician's. As you continue down the street, you come upon the entrance to the Charles Bridge. This is one of Prague's most iconic landmarks and although no doubt full of people, it is worth making your way through. The bridge was constructed in 1357 under the watchful eye of King Charles IV. The reason this bridge was always so important was that it connected the castle part of town, to the city’s old town. The bridge is 621 meters long and almost a whopping 10 meters wide! On either side of the bridge are two guard towers, once used for protection, now they only serve as a fascinating decoration for the tourists. Before heading onto the Bridge, there are a few points here to take pictures, and it's much better to do down here than on the bridge where the isn't an inch of free space and pickpockets are on the prowl. Across the bridge, you'll come to Malá Strana, or "Little Quarter" in Czech. This is the vast area of town situated on the hills below Prague Castle. In the middle ages, the city was divided into two halves, separated by the river and the Charles Bridge. King Ottokar II of Bohemia founded Malá Strana in 1257. The right side of town was the centre of the bourgeois, native Czech population. The left bank, however, was made up of many more German and Italian citizens, alongside some noble palaces. The king had brought with him many of these German craftsmen to help establish his city as one with some of the finest merchants and craftsmen in Europe. In Mala Strana, you can explore small shops filled with trinkets, perfumes, lace and more. You can explore the various devotional churches that have stood on these stones since it's foundation. You can eat and drink to your hearts content at the various traditional Czech pubs, bars and restaurants along the river, complete with a picturesque view of the right bank. At night, the streets are lit with lanterns and the crowds dwindle. Although it might be outside the inner city, it is a real treat to stay overnight on this side of two for a night or two. The experience is unique and one you should give a try! Most of the hotels on this side of town are housed inside beautifully restored buildings, and they give you a sense of what living in Mala Strana would have been like in the Renaissance. On the top of the hill in the Little Quarter, you'll find the Prague Castle. Although called a "castle" the area thus-named is more like its own neighbourhood than one building. This area is so vast and there is so much to see and explore it warrants it's own walking tour. We skipped over on this leg since we wanted to spend a significant portion of time dedicated to this area and didn't wanna rush through. If you are short on time, though, you can continue up the hill from the Bridge and wander around the Castle district, but for now, we're going to skip over this. The first stop on in the Little Quarter is St. Nicolas Square. The lower part of the square is now the site of the Holy Trinity Column, designed by Giovanni Batista Alliprandi. This was once the site of the gallows where hundreds of executions took place. But the column does not mark those events and rather is a monument to celebrate the end of the plague that ravaged the city of Prague. 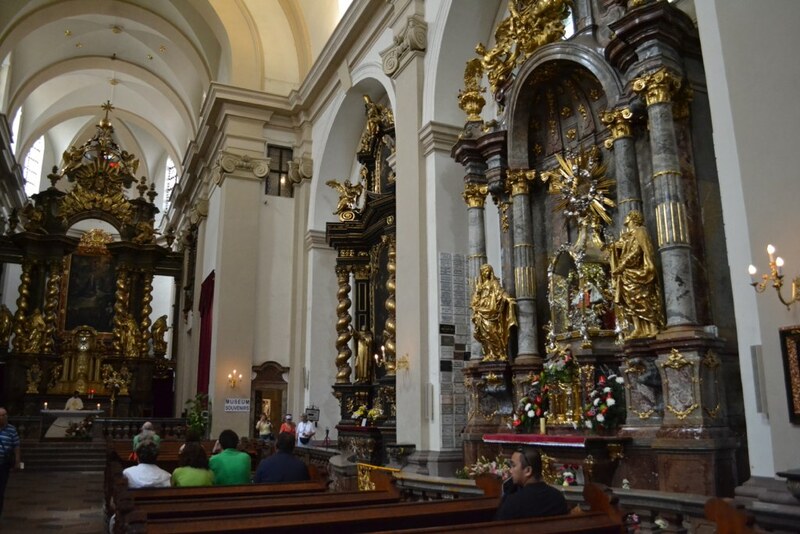 Along the column are the statues of various patron saints, including St. Wenceslas and St. John Nepomuk, two seminal saints for the city of Prague. I wasn't feeling to well and had to stop off at a pharmacy when we were visiting the square. Although I hope you don't have the same experience, this store is incredible and is one of the oldest in the city. Despite the new medicines, it feels like an old apothecary of the 18th century. Worth poking your head inside. St. Nicholas Church and the square has always served as a meeting place for citizens from the Little Quarter. It is the heart and soul of the city and as such, is an architectural marvel. Inside the church, you'll see even more extraordinary pieces of Czech artwork. The dome is finely painted with the scene of the apotheosis of St. Nicolas, the defender of children, seamen and his followers. Make your way across the Little Quarter's East end by taking this shortcut through this medieval archway. Walk down the small laneways and admire all the different shops along the road. So many of these places have been here for decades and the treasures you'll find within are truly unique. Along Prokopská you will see a few traditional pastry shops. If you're feeling like something sweet, go inside on of the cafes and ask for their speciality. We got some delicious flaky sweet filled with blueberries and cream. Perfection. As you make your way down, you'll find yourself passing by the John Lennon Wall. The Lennon Wall is a favourite spot for tourists and locals alike. Since the 1980s, people have been coming to visit this wall and covering it in graffiti relating to John Lennon and the Beatles. It represents all the ideals that John Lennon stood for; peace, love and equality. The origins of the first piece of graffiti are unknown, but it seemed to have caught on like wildfire. In addition to Lennon-inspired graffiti, in 1988 the wall became a place were young Czechs could air their grievances about the communist regime. Whenever local authorities would paint over the graffiti, the next day it would be covered up once more in poems and paintings. Eventually, they just stopped trying and accepted it as long as people stuck to graffitiing this one area and didn't start defacing the entire lower half of Mala Strana. Which, politely, they did. As you continue, you will also pass by the love bridge. 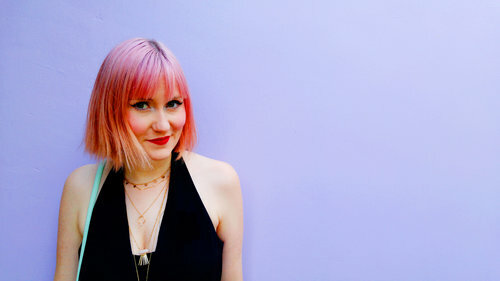 In the last decade, locking padlocks onto bridges has become a way of lovers to show their affection for one and other as well as leaving a piece of their love in the city. If you want to do the same, bring a lock with you and a pen and be sure to initial your names on the lock before securing it to the bridge. As you walk past the Lennon Wall and turn left, you will make your way down to Kampa Island. Kampa is a peaceful, green retreat from the busy city. On Kampa island, you'll see lots of local Czech families out to enjoy some time outdoors. There are outdoor sculptures all along the island, along with the Kampa Modern Art Museum. This Museum features the private collection of Meda Mládek and is a treat for anyone who loves abstract modern art. On your way out of Mala Strana, we pass across the Legion Bridge, this bridge isn't as large or scenic as the Charles Bridge but gives you an incredible view both of the Mala Strana and the Old Town. You also get a great view of Prague Castle with the Charles Bridge in the foreground from this point. This finishes our walking tour of Prague. Continue from here to either go back and explore the Castle District or head over to a museum (or two) and check out more about the art and culture of this amazing city.